So, 150 years ago, approximately... Seriously. The British Admiralty had a policy of dropping goats on islands to serve as food for shippwrecked sailors. There were many such islands along the coast of Australia, including Percy Island, which lies 70 Nautical miles to the South East of Mackay, Queensland. To this day, some of the heritage goats introduced to the Island by the Royal Navy in 1874 by Staff Commander Bedwell of the HM schooner ‘Pearl’ still inhabit this island. There is lots of information on the Percy Island website, and certainly worth a read! The Island is now under the Nature Conservation Act which has many categories of protection. Unfortunately the recently named ‘national park’ status of 83% of the Island prevents the goats from being recognised as a European Heritage animal. At Elon Hill Farm, we are proud to partner with several local goat breeders in keeping this fascinating heritage alive. Plus, they're amazing animals! On Monday we said goodbye to the last of the kids who were off to their new homes in Cairns. What a wonderful breeding and kidding season it has been! Each year our knowledge of goat husbandry grows alongside our confidence in this breed, to read more about what we have done and learnt click here to go to our blog page and read all about it. 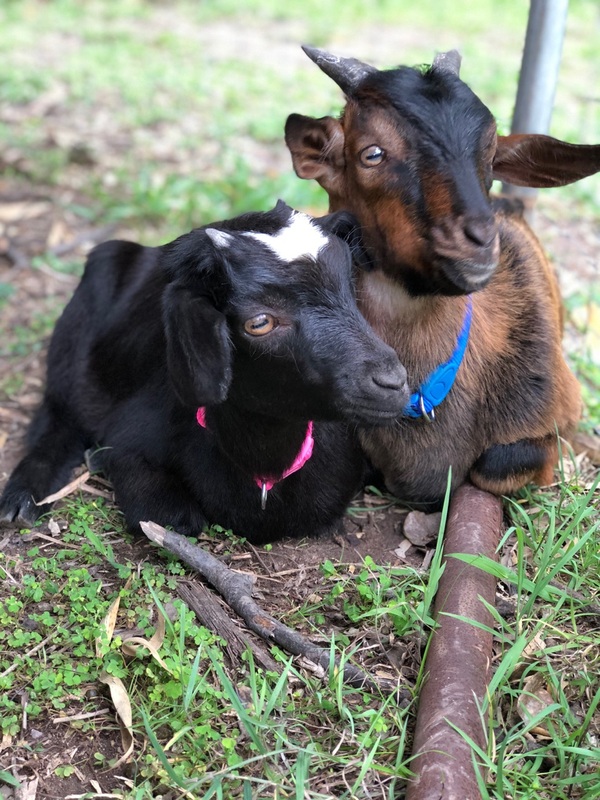 Here are the stories of the goats from Elon Hill that found new homes. Michele is a good friend of ours who was looking for a companion for her "dog-goat" (a goat that thinks it's a dog) to help with it's rehabilitation back into normal paddock life. "Rosaline", a triplet little sister seemed like a perfect match for what Michele was looking for. On her first night in her new home she escaped Michele's special seclusion area to join the other goats and despite her smaller stature seems to have hit it off with them! Horrah! In a couple of years we may see her back at Elon Hill to become a mummy goat! Thanks Michele and we hope you both have a wonderful time becoming good friends with each other. One day Jessica called us up from Cairns full of questions about how to become a Percy Island goat owner and breeder. She and her husband Tristan have been on a similar journey to ours on becoming self-sufficient and after a couple of minuets chatting we worked out that we were clearly going to become goat-nerd friends. We are so happy to be passing on two of our loveliest little does, sisters "Osnat" and "Cleopatra". They have the potential of becoming milking goats but their main purpose will be for breeding kids for meat for Jessica and Tristan's family. No one likes the aspect of killing and animal for meat, especially those who have first hand contact with, but like us here on Elon Hill we think Jessica and Tristan will give them the greatest honer by using them to their full potential, completing the full circle, weed and plant eating, birth, life, eating for meat and then back again. This years kids have been born! And they are so beautiful! We always forget just how tiny they are. This is the first season of kids we've bred on Elon Hill Farm and we are amazed at their continuing beauty and resilience. We love that these goats have history in this area and are adapted and resilient to our tough local conditions. We truly believe this heritage breed is the ultimate homesteading goat for this region and perfect for both small and large scale farming ventures. 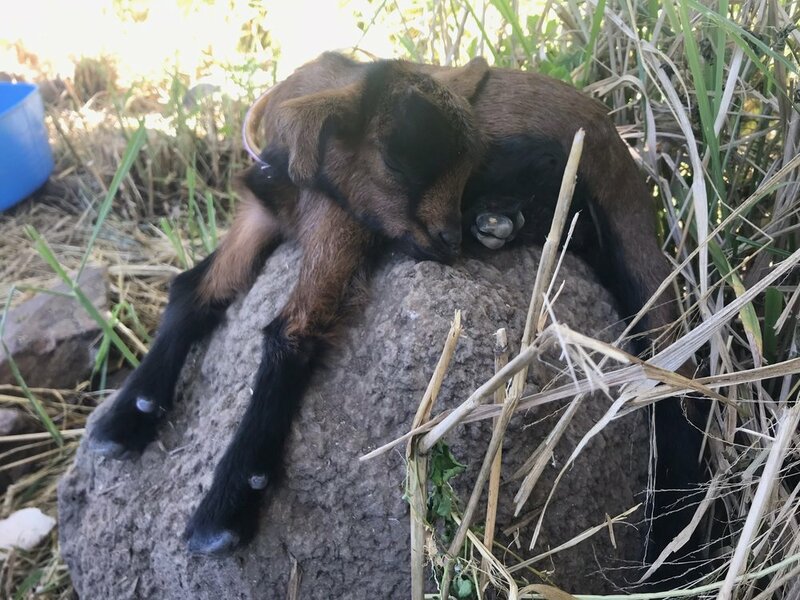 If you would like have a chat with us about the Elon Hill Farm Percy Island Goat breed please feel free to e-mail or call us via our website contact details. In the meantime check out some of our cute baby goat videos. "Dinah" and her doe twins, one pure black and the other with her fathers distinct black and brown highlights, perfect! Now to think of some names! We've had a wonderful first year finding new homes for our heritage Percy goats so we wanted to tell you all about it. Sandy, Julie and Curtis are a wonderful family who I met when I sold them some of our original goats. They have a small farm with some goats and cattle, which originally they wanted to help keep the paddock grass down, but from visiting them the first time I saw how much they loved and cared for these animals that had come into their lives. One of their male goats had gammy front legs that didn't bend properly making him look like he was walking on stilts. But they gazed on him with fond eyes non-the-less. One day Julie and Curtis came to one of our home-grown trade days where they met Jessica our orphaned Percy doeling who we were bottle feeding at the time. Needless to say they fell in love with her and wanted to know if we had any more babies available. A few weeks later they bought two little ones, a boy and a girl who they called Hansel and Gretel. That is Curtis you can see in the picture and Julie off to the side sitting with them in their first few days to help them settle into their new home. Louise and Bruce are part of a dedicated group of people in this region who are committed to preserving and promoting this fantastic heritage breed. They bought from us a beautiful rose-grey buckling shown in the picture to the left and a doe and her doeling kid as seen in the right hand pictures. Never have I seen a more dedicated technician than Mandy. 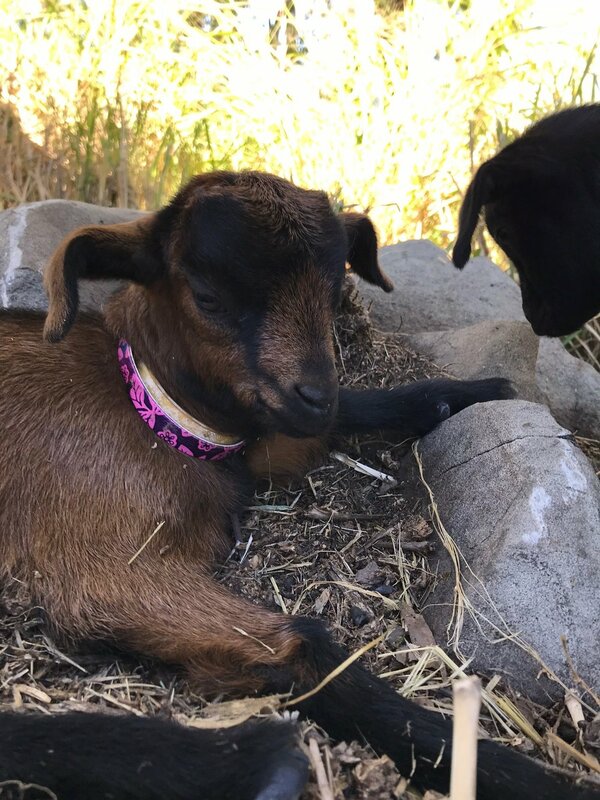 She is a first-time goat owner but has taken to it with heart and passion. She bought Hansel and Gretel as a pair (Hansel is de-sexed) and has worked on the clicker-training method with them achieving great results. Check out this video to see where she was as after only a couple of weeks of training. I can't describe how exciting I find it when I meet people like Mandy who engage with their animals in ways that I've never thought about. I love to see people who "Nerd-Out" in their prospective fields because they go deeper into learning about things than the average person would bother with. From watching Mandy I now know these goats are much more intelligent then I first thought. It makes me think about a conversation I had with her one day about how she used clicker-training for her horses. She said it was like being friends with a deaf or mute person and being able to "speak" to each other for the first time. I have a much deeper appreciation now for the spirit and personality of these lovely little goats thanks to Mandy. Our friends Eric and Wendy are some of the most inspiring people I know. These guys are some of those awesome technicians who "Nerd-Out" in their prospective fields. A couple of years ago Eric retired and came home to work alongside his wife Wendy on their property Pine Tree Cottage. Here at Elon Hill we are in the process of becoming completely self-sufficient but it is people like Eric and Wendy who are leading the way in self-sufficiency in this region. They grow all their own fruit, veggies and meat (duck, turkey, beef etc.) they are always preserving something in some way or another and, as Wendy has told me, their fridges and freezers are bursting with what they have produced. This last year has been a real struggle for them as their main access road to town (The Sarina Range Road) was cut off during a major cyclone earlier in 2017 when a massive land slide washed the entire road off the mountain. Where they once had a 20-minute trip to town it now takes them an hour and a half on rough dirt roads. I wanted to give their awesome website a shout out here. Check it out to find some wonderful stories of their every-day lives and excellent resources for cooking and preserving.